Tree damage and some landscaping can be covered under some insurance policies. If you experienced any damage to the structure from a tree, then the damage from that collision is covered as well as the tree’s replacement, in some cases. Some large trees can cause serious and costly damage to a property. 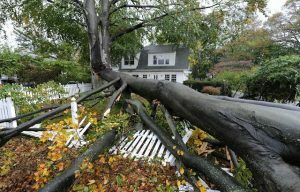 If you have lost a tree, or suffered damage to your property as the result of a fallen tree, then a Certified Public Claims Adjuster can help you get the compensation that you deserve! We work to get a speedy and thorough resolution and we don’t get paid until you do. Contact us now using the form below or via phone at (800) 580-5650 for your Free Consultation with an experienced Certified Public Claims Adjuster at Reliable Claims Adjusting! The Best Man for your claims.